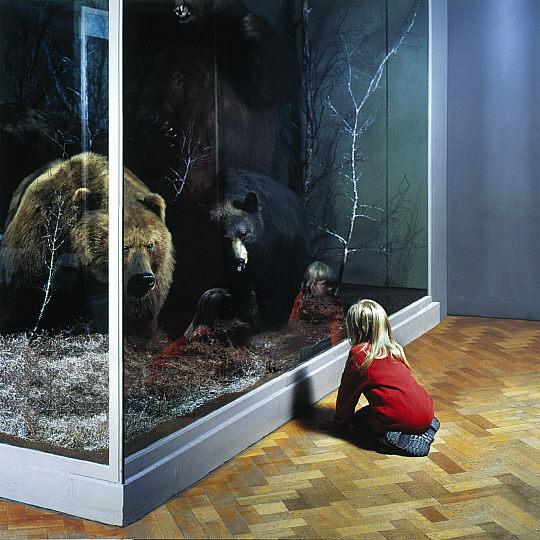 At first sight pretty much any of the pictures in Wendy McMurdo’s series In a shaded place could be a straight photograph. If what you see is what you get, these are twins, dressed the same as some twins are. There is a slight oddness, possibly from the exact similarity of the outfits, but nothing more. But the titles suggest a singularity that is absent from the image. Which twin is Helen? We’ve long since worked out that the camera often lies. Though we may read it as real, the photographic image may be every bit as much a construct as a painting. 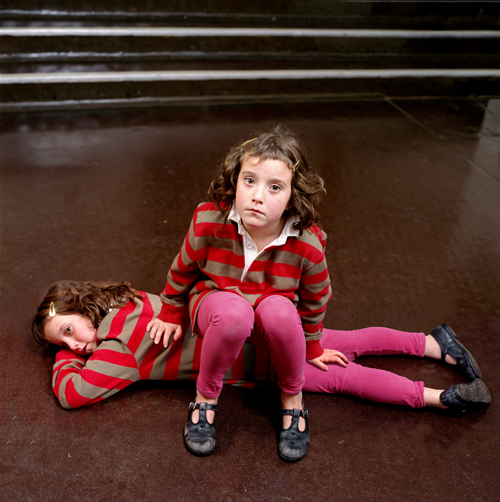 It is into this territory that McMurdo steps, offering images of children their doppelgangers, or encountering reflected versions of themselves that somehow don’t quite ring true. But the uncanny nature of McMurdo’s world seems sane and safe when we enter the world of Inez van Lamsweerde. Those who inhabit the images in her series The Forest are strange, and seem oddly ecstatic about their own otherness. It’s hard to put one’s finger on quite what’s wrong at first. Is it the looks on their faces that make these men seem strange; certainly it helps things along. And the matching yellow tops are curious attire. In the end though, it’s their hands that just aren’t right. Men’s hands shouldn’t – and indeed don’t – look like that. The realisation that these men have women’s hands make me wonder even more about those looks of ecstasy. Digital image making – and in particular, digital image manipulation – often leaves me cold. McMurdo and van Lamsweerde somehow manage to hold my attention with the strangeness of their version of normality. This entry was posted in Photography and tagged art, digital images, In a shaded place, Inez van Lamsweerde, Museum, photography, The Forest, Wendy McMurdo by Ann Jones. Bookmark the permalink.